HAVANA, Cuba – U.S. President Barack Obama and his Cuban counterpart Raúl Castro vowed Monday in Havana to set aside their differences in pursuit of what the U.S. president called a “new day” for the relationship between the neighbors. Castro acknowledged there were still “profound” differences over human rights and the decades-old U.S. economic embargo. He pointedly refused to acknowledge that Cuba holds political prisoners. But Castro said the former enemies should take inspiration from U.S. endurance swimmer Diana Nyad, who in 2013 managed on her fifth attempt to become the first person to swim from Cuba to Florida without a shark cage. “If she can do it, we can do it too,” Castro told journalists after more than two hours of talks with Obama in Havana’s Palace of the Revolution, the nerve center of the communist government that has ruled Cuba since the takeover by Raúl’s brother Fidel Castro in 1959. Obama, the first U.S. president to visit Cuba in 88 years, hailed a “new day” — a “nuevo día,” as he said — in relations between the former Cold War foes. But he insisted that Washington was not going to give up pressing for political freedoms in Cuba, where the Communist Party controls politics, the media and the economy. The United States “will continue to speak up on behalf of democracy,” he said. Meeting Castro for only the third time for formal talks, Obama was greeted by a military band at the Palace of the Revolution. Obama, under pressure back home to show that his scrapping of more than half a century of U.S. hostility to the Castro regime is paying off, then sat for discussions against a backdrop of tall tropical plants and the two countries’ flags. Earlier he laid a wreath at the monument of Cuban independence hero José Martí. On Tuesday, he was to give an address carried live on Cuban state television, and then attend a baseball game between Cuba’s national team and Major League Baseball’s Tampa Bay Rays, before flying out. But the brief detention of dozens of pro-democracy protesters hours before Obama’s arrival Sunday served as a stark reminder of the regime’s iron grip on power. “I think Raúl does not want a warm relationship with the US. 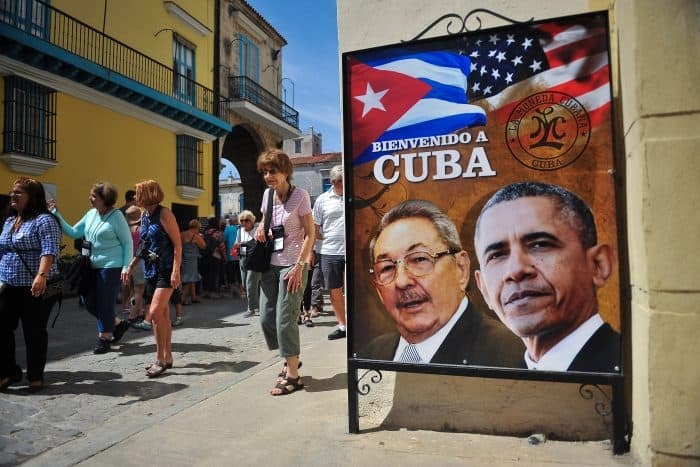 He sees it in limited terms for the moment — tourism revenue and remittances plus the changes to the sanctions,” said Paul Webster Hare, a former British ambassador to Cuba who teaches international relations at Boston University. Obama’s administration is betting that forcing Cuba to open up diplomatically, as well as a gradual relaxation of the embargo, will promote democratic change. But Obama is defending himself from critics who say he has given away too much. In a sometimes awkward public appearance in which Castro fiddled with his headphones and complained about translation problems, the Cuban president unexpectedly fielded questions from U.S. reporters. 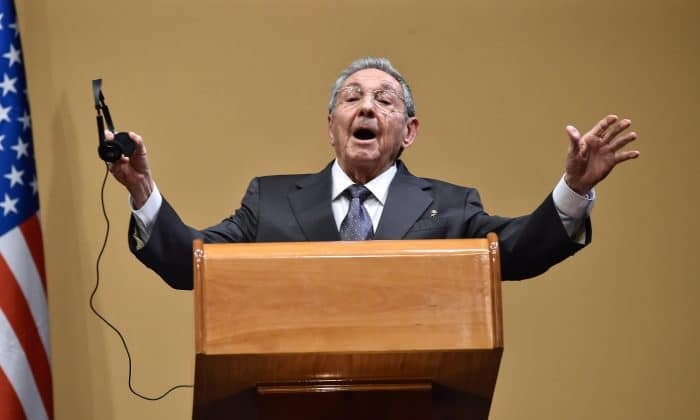 “Give me a list of the political prisoners and I will release them immediately,” Castro said when challenged about the Communist island’s human rights record. “After this meeting is over, you can give me a list of political prisoners. And if we have those political prisoners, they will all released before the night ends,” he said. Human rights groups immediately shot back with the names of dozens of prisoners being held in Cuba. 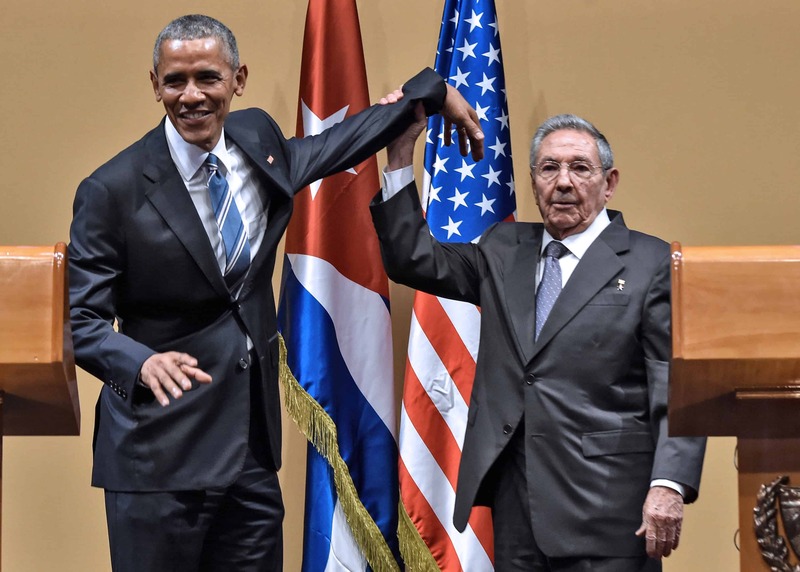 And at the end of the conference, President Castro attempted to hoist President Obama’s arm into the air for a victory photo op. Obama balked and the two shuffled offstage.